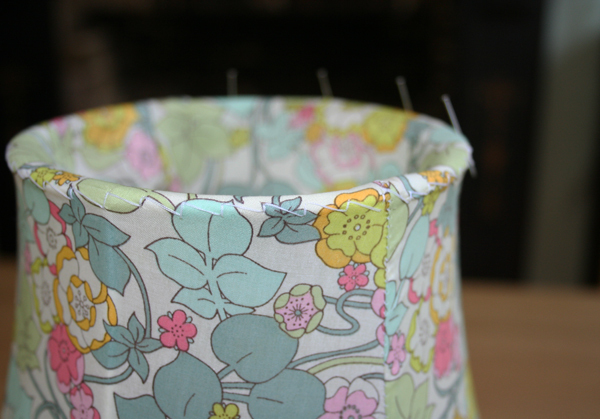 It’s been too long since my hand-stitched lampshade course and I’m only just finishing off my next project. Luckily I have some really good handouts from the course but I wish I had made another one straight away! I remembered how to do the outside fabric but really struggled with the lining, taking two attempts to get it right. I know it shouldn’t have been hard but I’ve learnt a few things from the experience. 1. always have a go as soon as possible on your own after attending a course – it might all make sense when you’re there but things look very different when you’re trying to do it on your own. 2. Make sure you get handouts from a course if you can and make your own notes as you go through. 3. Don’t panic, you can always do it again and get there in the end, learn from your mistakes – I definitely won’t make the same mistakes next time! I’m really lucky I had such a good teacher, Angela from Cocoon Home, who I’ve been able to email for advice and support, thanks Angela! Nearly there now though, I just need to add some trim to the top and bottom to finish it off. If you look really closely you can see the streetly stitching at the front of the lampshade and lethal pins at the back! The fabric is a 100% cotton Liberty print called Boxford A Jersey from the SS12 Whitworth collection. It’s very pretty and floral and colourful and also very me! Recipe competition – win one of my tea-towels!